In the historical and beautiful site of the Original El Rancho Grande home, is the Inland Empires hidden jewel, Hidden Oaks. We offer a mountain-like event center perfect for the perfect banquet, wedding or corporate meeting. Outdoor gazebo, fountain and wooded trees make this the idea venue for your special occasion. Serving Rancho Cucamonga, Upland, Claremont, Ontario, Etiwanda, Chino and surrounding cities. Please be aware that we do not allow alcohol. Wedding Package includes: - A five hour block of time for Wedding/Reception, including decorating and clean-up. - Historical Residence - Outdoor lawns and gardens - Beautiful Gazebo - Bride’s Room - Rehearsal (approx. 1 hour) - Hidden Oaks Facilitator - Table & Chair set-up/tear down - Security/Parking Attendant * Additonal charge of $10/ person for groups over 200 guests * Additional time may be added to package @ $100.00 per hr. * 25% deposit of the rental cost is required to reserve a date. * $250.00 Damage/Cleaning deposit (refundable) * Deposits are non-refundable * Prices include white resin padded chairs and 60" round tables * Catering/Sound services are not provided by Hidden Oaks. Referrals available. Contact for complete terms and conditions - Alcoholic beverages and smoking are prohibited on the Hidden Oaks premises. - Music for the reception must be played on the north patio only and must be turned off by 10:00pm. - Any activity or ceremony that is contrary to orthodox Christian beliefs will not be allowed. - These restrictions will be strictly enforced. Wedding Package includes: - A seven hour block of time for Wedding/Reception, including decorating and clean-up. - Historical Residence - Outdoor lawns and gardens - Beautiful Gazebo - Bride’s Room - Rehearsal (approx. 1 hour) - Hidden Oaks Facilitator - Table & Chair set-up/tear down - Security/Parking Attendant * Additonal charge of $10/ person for groups over 200 guests * Additional time may be added to package @ $100.00 per hr. * 25% deposit of the rental cost is required to reserve a date. * $250.00 Damage/Cleaning deposit (refundable) * Deposits are non-refundable * Prices include white resin padded chairs and 60" round tables * Catering/Sound services are not provided by Hidden Oaks. Referrals available. Wedding Package includes: - A seven hour block of time for Wedding and Reception, including decorating and clean-up. - Historical Residence - Outdoor lawns and gardens - Beautiful Gazebo - Bride’s Room - Rehearsal (approx. 1 hour) - Hidden Oaks Facilitator - Table & Chair set-up/tear down - Security/Parking Attendant * Additonal charge of $10/ person for groups over 200 guests * Additional time may be added to package @ $100.00 per hr. * 25% deposit of the rental cost is required to reserve a date. * $250.00 Damage/Cleaning deposit (refundable) * Deposits are non-refundable * Prices include white resin padded chairs and 60" round tables * Catering/Sound services are not provided by Hidden Oaks. Referrals available. Package includes: - Use of meeting rooms - Tables/Chairs? Price List: - Day price ..............................................................$600.00 (8 hours) - Price for event......................................................$100.00 per hour (minimum 3 hours) - Setup & cleaning fee..............................................$75.00 - Damage/Cleaning deposit...................................$250.00 (returnable if property is not damaged or missing). *$100.00 deposit (non-refundable) is required to book a date. (to be applied to total cost event). **Price may be adjusted based upon the complexity of the event. Contact for complete terms and conditions - Alcoholic beverages and smoking are prohibited on the Hidden Oaks premises. - Music for the event must be played either indoors or on the north patio. - Music must be turned off by 10:00pm. - Friday, Saturday or Sunday events must be booked no earlier than two months in advance, unless Lessee is willing to book a 6-hour event at $2,000.00. ?- Any activity or ceremony that is contrary to orthodox Christian beliefs will not be allowed.? - These restrictions will be strictly enforced. Package includes: - Historical Residence, Outdoor lawns and gardens - Standard tables and white padded chairs - Table & Chair set-up/tear-down - Event Hostess and security/parking personnel where needed ?Price List: - Prices begin at an hourly rate of $175.00 per hour depending on your guest count. - Please call the office to schedule a tour and receive pricing details. Contact for complete terms and conditions. - Alcoholic beverages are not permitted on the Hidden Oaks premises. - We are a non-smoking facility. - Music for the event must be played either indoors or on the north patio and turned off by 10:00pm. - Weekend events must be booked no earlier than 60 days in advance, unless Lessee is willing to book a 5-hour event at $2,500.00 (including tables & chairs). ? ?- Any activity or ceremony that is contrary to orthodox Christian beliefs will not be allowed. - These restrictions will be strictly enforced. 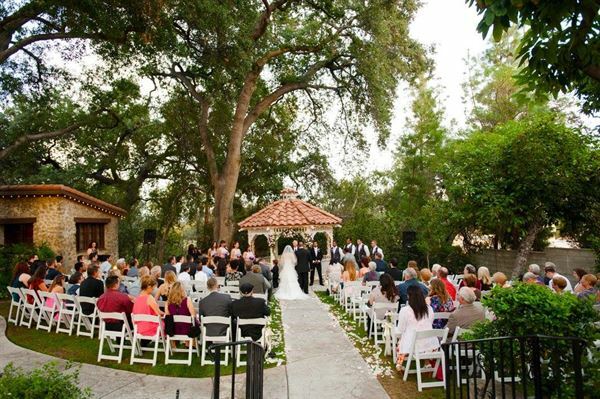 Special Features: outdoor gazebo, wooded trees, historic old California style.